… or Developing Your Gardener’s Eye. I’ve mentioned in previous posts about developing what I call your gardener’s eye. By which, I mean knowing what your garden looks like generally and what it ought to look like, so you notice changes that can signal an issue of concern. 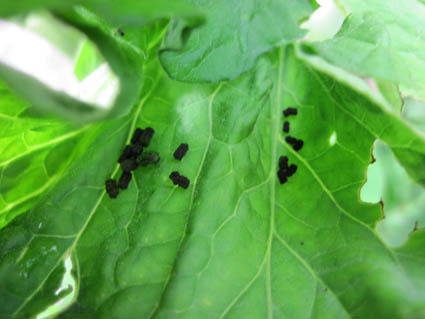 In caring for a garden organically, catching a problem early is especially important. I was at a client’s garden pruning the tomatoes (more on that another time) when I noticed the following. At first I just noticed a small amount on one leaf and didn’t think much of it, but then I noticed more on other leaves and decided I should take another look. To my gardener’s eye this looked like frass (caterpillar excrement), even though it was definitely different than the only other frass I’m familiar with. As I looked more closely at the tomato plants I quickly spotted a small tomato hornworm. And I found 4 more throughout the tomato patch. 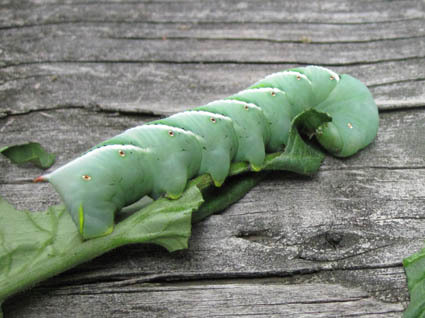 This was a revelation to me, because I’ve never manged to spot a tomato hornworm until it was at least a couple of inches long and had done a lot of damage to my plants. 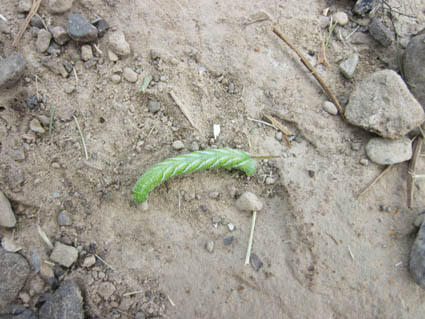 I was also surprised to spot the hornworm so easily, because I’ve often had trouble spotting the big ones. However, I realized that the white stripes on the small caterpillar are much closer together than those on a mature hornworm making the small hornworm stand out against the color of the leaves much more than a large one. 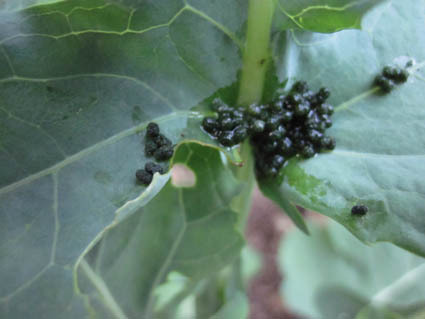 So now I will look for this clue of caterpillar poo to save a lot of damage to my garden. You can too, with this problem, and others, as you develop your gardener’s eye.